The Naga Viper was created in England by chilli farmer Gerald Fowler of The Chilli Pepper Company, based in Cumbria England. Tests were conducted by the Warwick HRI Mineral Analysis Laboratory, UK, in November 2010 to determine just how hot the Naga Viper was, coming in at 1,382,118 Scoville Heat Units (SHU). It was briefly declared the “World’s Hottest Chile Pepper” in 2011 by Guinness World Records. Reportedly grown in a greenhouse during wintry weather, it is an unstable three-way hybrid produced from the Naga Morich, the Bhut Jolokia and the Trinidad Scorpion (some of the world’s hottest peppers). Due to its hybrid nature, it is unable to produce offspring exactly like the parent. 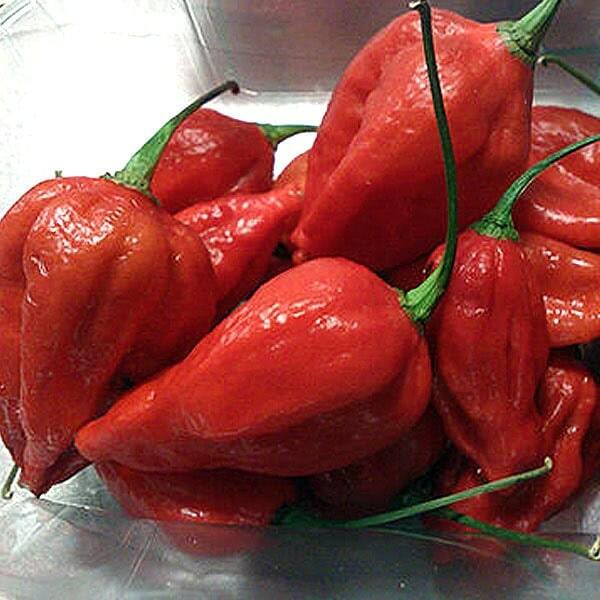 This variety is closely linked to the Naga Morich and may or may not be a different variety. In 2012, it was surpassed by the Trinidad Moruga Scorpion and in 2013 the Carolina Reaper for hottest pepper in the world.